An interesting light fixture in a Gulick | One semi-custom Grayson in Great Falls. 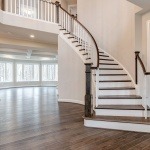 The Foyer and Conservatory in a Gulick | One semi-custom Grayson in Great Falls. A few of the custom details in a Gulick | One semi-custom Grayson in Great Falls.